During a Greek wedding (which usually lasts a few days) the groom and his side of the family throw a party and the bride and her side throw another, and they don't see each other until the groom and his groomsmen/friends try to "steal" the bride away, while the men in her family try to stop it from happening. Like throwing flour all over the groom... Since Sebastian isn't from the same town and he couldn't throw his own party, we were allowed to join their "intimate close-family party". But he still tried to steal his bride away, hence all the flour. We ate, drank, got caught up with family, and of course, we danced. It was adorable watching the young little Swedish and Greek children playing together even though they didn't understand each other one bit. The next day there were no "official" wedding events so naturally there was a just as official football game. Swedes vs. Greeks / Vikings vs. Olympians - it was intense, and if I may say so myself, the Swedish Cheerleaders were amazing. Unfortunately the Olympians clearly had a home-court advantage and since all of them were cousins or in some way related they obviously had quite an upperhand so...they won. but I mean, we won in Spirit. Wedding Day! 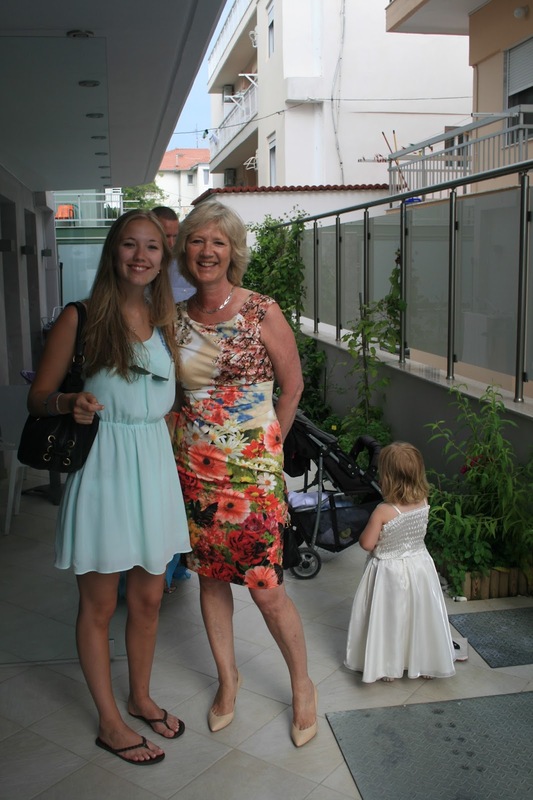 Me and my momma, and our own little swedish bridesmaid, adorable! Another tradition that was new to us, everyone in the Groom's family has to help in getting him dressed, literally. Each person gets a seperate piece of clothing to put on, I put on his left shoe, and my sister put on his right shoe. It's a hilarious tradition. After the ceremony, aren't they adorable together? Shortly after we got to the reception there was a performance of 3 different kinds of Greek dancing, such a good idea to share that with the guests, and it was all really cool, I wish I could dance! Or actually, scratch that, I wish I was Greek! I tried to dance a little...learning the steps are not as easy as it seems...learned that the hard way. And by hard I literally mean hard, I got stepped on by 2 stilettos, I was wearing flimsy flip flops, oops! Made some new friends, my other cousin, Anton's, hilarious girlfriend, Cara! The wedding ended at 4 and after some consideration my sister and I decided not to join the younglings at a night club, which ended up being the right choice. They open at 5 and close at 10 and they all got back at 8 in the morning - those crazy greeks.